Aquaria Palaoa is a different kind of opera performance, where the protagonists sing in, out and under the water of a swimming pool, in Berlin, Germany. Claudia Herr, a former swimming champion before turning to a music career, is the mastermind behind the unique Aquaria Palaoa project. 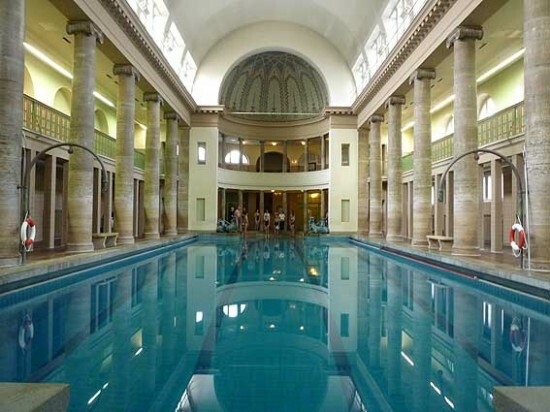 In an interview with news agency AFP, Herr said she first got the idea for hosting an opera show at an indoor swimming pool the first time she visited the art nouveau Stadtbad Neukölln pool, in Berlin, 10 years ago. The large hall, complete with neo-classical pillars made her feel like she was at the opera. Playing the lead role in Aquaria Palaoa, the former swimmer turned opera performer dives into the pool in a green evening dress, telling the story of a woman looking for the elixir of eternal youth. She sings both above and under the clear water of Stadtbad Neukölln, with the help of oxygen tanks. Special microphones transmit underwater sounds to speakers set up around the hall. Claudia’s voice, and those of other singers also singing underwater (but without oxygen tanks) are mixed with sounds recorded 100 meters under an ice shelf, in Antarctica. Meanwhile, the orchestra stays dry and accompanies them from the side of the pool. “Sound underwater is much weaker, it is muted. But that gives it a bit of a mystical quality” Claudia Herr says about her performance. If you’re intrigued by the idea of an underwater opera show, Aquaria Palaoa runs from May 1 until September 17, in Berlin.